I believe my fascination with pigs began one Labor Day while attending our river-town’s parade and celebration. People who don’t regularly venture out of their holler will rarely miss an opportunity to buy a stockpile of cheap fireworks or fool little ones on carnival games. I was said fool to “See the World’s Biggest Pig.” I spent a whole month’s allowance before I realized I wasn’t tall enough to see into the pig’s box, so I begged my big brother for help. He was older and wiser, and made me promise I’d tell him what the pig looked like in return for the boost. Utter disappointment: it was just a mirror and a pile of pig poop for added effect…(stink and mirrors?). I was left confused and out of funds. He laughed, called me a pig, and went on to win big at a speed pitch game the way brothers do. Regardless of the still hot temperatures, schools have started back and the official end of summer approaches. I feel pressure to squeeze in summer recipes and wear all my white these last few weeks before Labor Day (I’m a traditionalist). 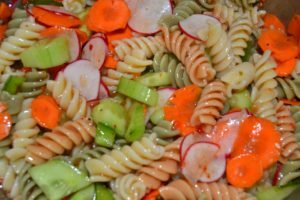 One such recipe that is getting a final go-around is a simple pasta salad. It’s a go-to side dish that pairs great with grilled chicken at a cookout. 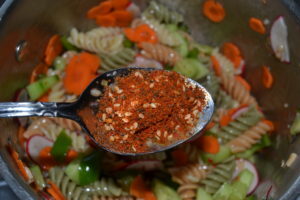 I remember my first bite of Mom’s cold pasta salad—rather, “curly pig tails”—at our evening cookout. Unlike my carni experience, it was complete satisfaction. There are many variations of this recipe, and it’s easily tweaked to the family’s preferences and the pantry’s contents. 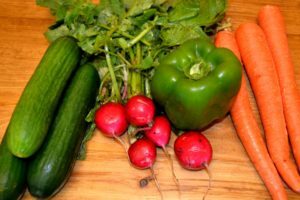 Appalachian cooking is often just about using what you’ve got….and hopefully your pantry isn’t just an empty box. A friend loves at all times, and a brother is born for times of adversity. 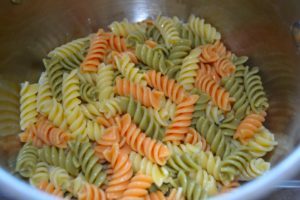 Start by preparing a tri-colored rotini pasta according to package instructions. 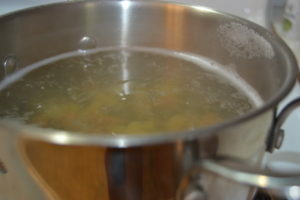 After the pasta is done cooking, drain, and run cold water over the pasta. Mix in your veggies, Italian dressing, and add a bit of zing with the Salad Supreme. It may appear to be too much dressing, but the noodles soak it up. Cover and chill in refrigerator for at least 2 hours, and then enjoy! 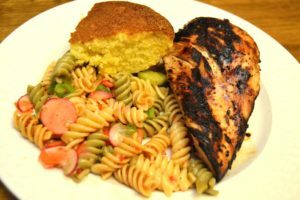 This pasta salad pairs great with grilled chicken. 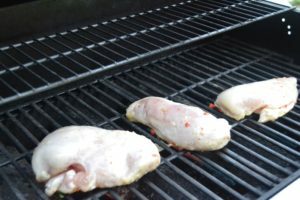 For this particular supper, I marinated large chicken breasts all day with my remaining Italian dressing and honey. Wade does the grilling. It’s incredible how many stunning pictures of the chicken he took, but I think one action shot will do…. And of course, no supper is complete without cornbread. What a great summer meal…. and teamwork! Cook pasta according to package instructions. Drain and run cold water over pasta. Drain again, add veggies according to preference. Add Italian dressing and Salad Supreme. Cover and chill for at least two hours. Can be made a day in advance. Yield: 8 servings. 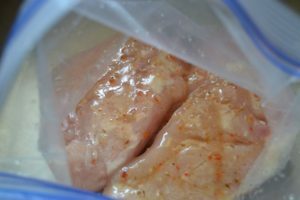 Place boneless, skinless chicken breasts in a plastic bag. 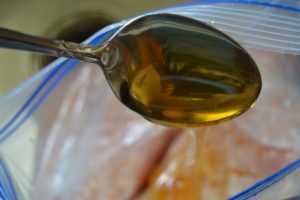 Add Italian dressing and honey, mix in bag to cover. Place in refrigerator for 4-6 hours or overnight. Great for grilling!